Group B Streptococcus (GBS) is a common benign bacteria found near the vaginal opening in women. During delivery it becomes a common pathogen causing maternal chorioamnionitis as well as neonatal sepsis. 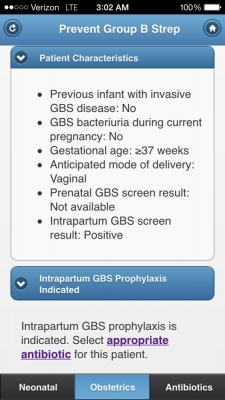 As a means to prevent neonatal deaths as well as maternal morbidity, guidelines have been developed to help physicians prevent and treat GBS disease during its multiple stages of presentation. 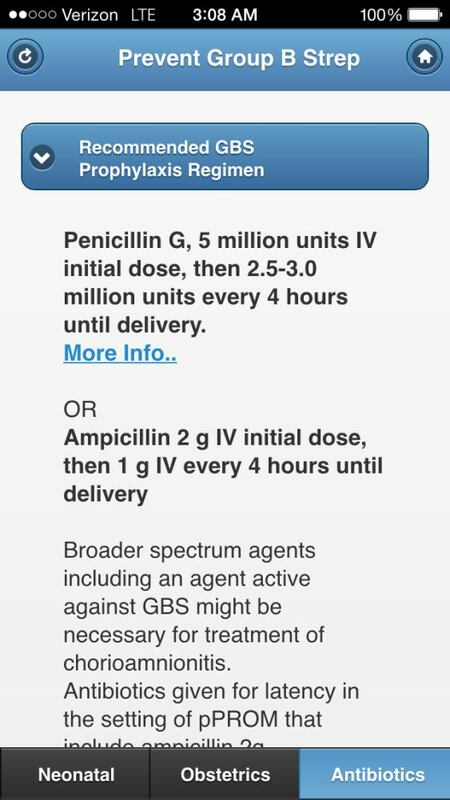 The guidelines can be a bit confusing to navigate from memory alone and thus, the Centers for Disease Control (CDC) has created an iPhone app to assist. 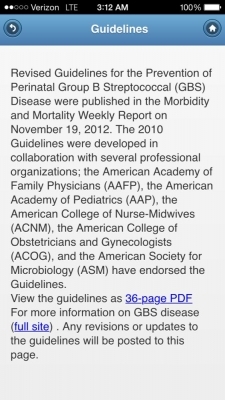 The app, Prevent Group B Strep offers the most recent guidelines, published in 2010. 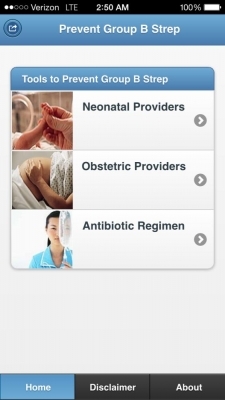 The app opens to a navigation menu to differentiate between the provider pathways: Neonatal providers versus obstetric providers. 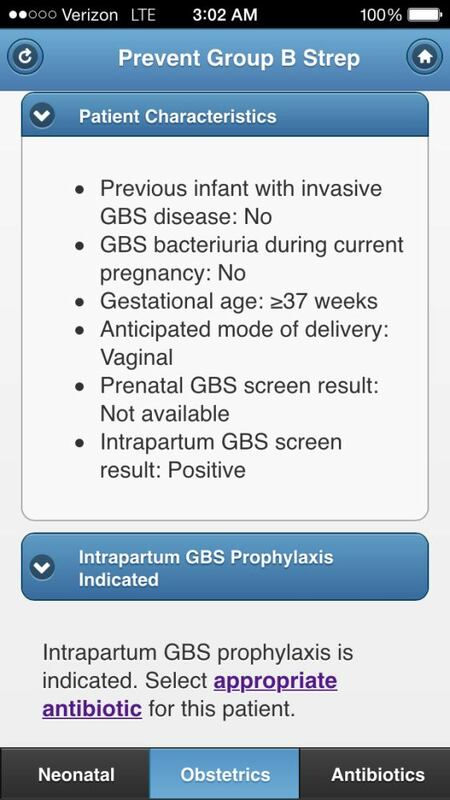 For example, once the the obstetric provider option has been selected the user is presented with a series of questions clarifying previous GBS occurrences as well as prenatal GBS testing results. After answering the individual questions, the app offers treatment recommendations based on the results. The questions, as well as navigation, are straightforward. 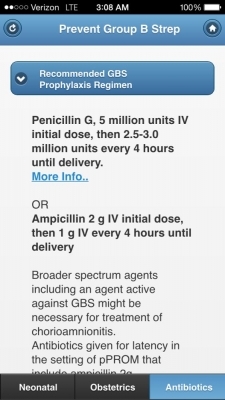 The third navigation option, “Antibiotics”, directs dosing regimens in penicillin non-allergic and penicillin allergic patients. As a nice addition, at the bottom of every screen is a toggle button that can quickly take the user to any of the three navigation options. While on my night float on my family practice service, I receive a call about a newborn whose mother was treated for chorioamnionitis. I open my Prevent GBS app and navigate to the neonatal section. After answering that the child does not have signs of neonatal sepsis but the mother was diagnosed with chorioamnionitis, I receive the following recommendations: obtain blood cultures, CBC, and treat with antibiotics. Direct link to guidelines within the app. Useful application made by a reliable source. P.J. is a family practice resident at Mercy Family Health Center in Sacramento. A transplant from the cold north of Minnesota and a graduate of the University of Minnesota Medical School, P.J. now lives in sunny Napa Valley. His interests in medicine include Family Practice, Critical Care, Palliative Care, and Quality Improvement. P.J. was drawn in to write for iMedicalApps after finding himself with over a hundred medical related iPhone apps, the default contact for his clinic’s E.H.R.